﻿ How Much Did the Climate Talks in Durban Accomplish? How Much Did the Climate Talks in Durban Accomplish? The original version of this article, by Ruth Greenspan Bell and Barry Blechman, appeared on Foreign Affairs. The outcome of the recent Durban climate conference represents a victory, of sorts, for a particular vision of how the community of nations might eventually gain control over greenhouse gases. But that vision is flawed, perpetuating an approach that, after more than 20 years of negotiations, has not reversed warming trends. Of particular concern is the continued insistence on a comprehensive deal negotiated by all nations through a UN process. The degree to which the meme of a “legally-binding” agreement has dominated thinking is likewise troubling. Our October article, “Beyond the Durban Climate Talks,” examined an alternative negotiating pathway – one based on the effective model of nuclear arms control. There, specific issues were opportunistically segmented for resolution. And, in some cases, negotiators achieved progress by working in alternative fora that were not wedded to the UN ground rules, especially the ones that give every country, no matter how small, a potential veto on the results. Unfortunately, the Durban result continues the well-trod UN pathway. The meetings saw protracted debate about how precisely to characterize the “legal” and “binding” nature of a future agreement that might emerge in 2015 from yet another “new” round of negotiations. Indeed, the supposed distinction between “political” or “voluntary” and “legally binding” agreements has dominated United Nations Framework Convention on Climate Change negotiations for years. Yet such distinctions break down upon closer examination. Ruth Greenspan Bell is public policy scholar at the Wilson Center. 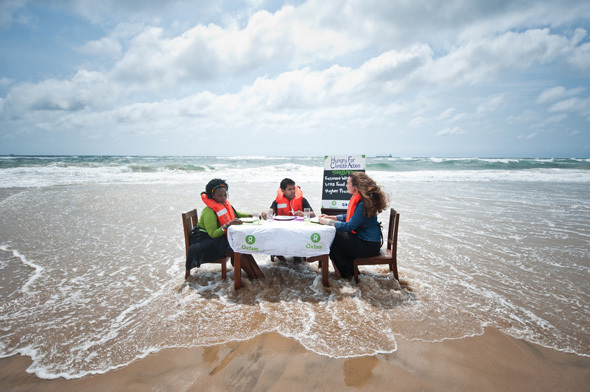 Photo Credit: “Oxfam hungry for climate action at Durban Climate Conference,” courtesy of Oxfam International and Ainhoa Goma.